This past Sunday I celebrated* my fourth year gluten free. Four years ago, I thought that I'd be going off gluten just for two weeks and then I'd be devouring bread once again. Little did I know I'd soon find out I was indeed a coeliac and gluten would be off the menu forever! We've been laughing at my Timehop posts from four years ago as I navigated my new gluten free life.... just one day after starting, my facebook post simply read; "Gluten free bread? More like spackle....". When I first went gluten free the gluten free bread choices were slim. I remember crying in the supermarket over the disgusting gluten free bread whilst my Mum picked up soft fluffy loaves of "normal" bread. 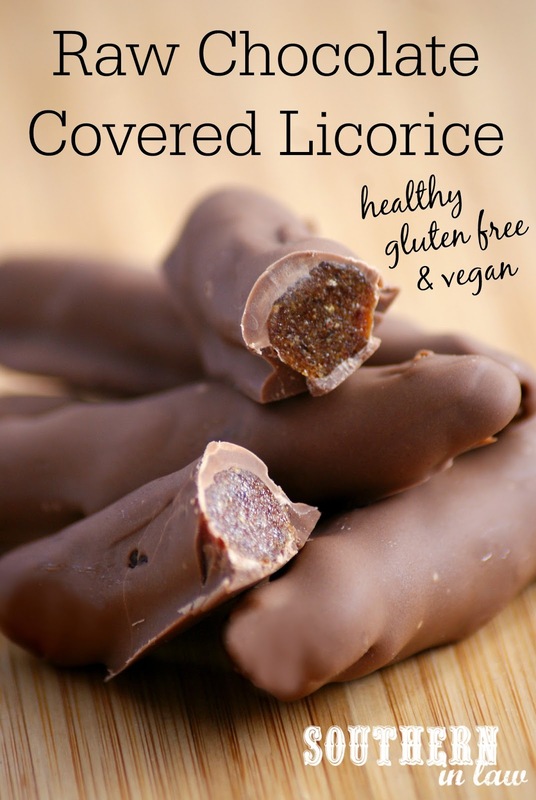 As I started my new gluten free life I learned how many of my favourite foods were off the menu - and one of those foods was licorice. You see, licorice is an acquired taste, but I have been a licorice lover for as long as I could remember! In fact, it was one of the few lollies I actually liked. Whilst I've had gluten free licorice, I was never satisfied with the taste or texture and so I took matters into my own hands. 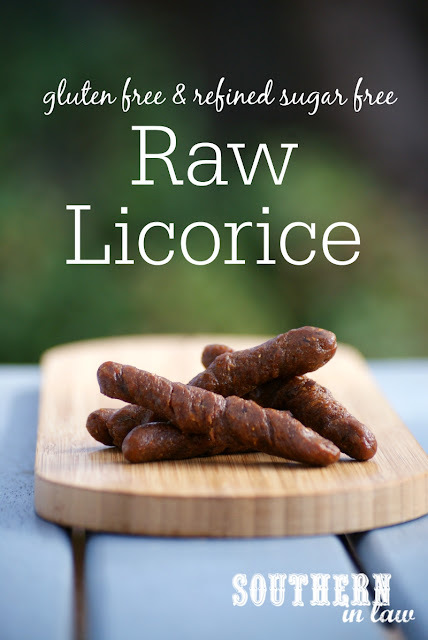 I've had dozens of sticky experiments - some successful and some way too tedious to ever attempt again, however, recently I came up with the perfect healthy licorice recipe - and it only has two ingredients. I was actually debating whether or not to share this recipe with you as it's so ugly looking, however, when I realised I'd polished off yet another entire batch in just a few days, I knew it was too good not to share and so I put the question to you guys on Facebook, Twitter and Instagram (and this is why you should follow us!). The feedback was pretty clear; the recipe was definitely wanted. And I can't blame you.... it really is that good. A chewy licorice that's made up of all natural ingredients, with no artificial ingredients, no refined sugar and absolutely no gluten? What more could you want?! Well... I suppose you could wish it was covered in chocolate - and your wish is my command, friend! Healthy Raw Licorice Recipe makes about 16 "twists"
Add your dates into your food processor or Cuisine Companion, fitted with the ultra blade. Process your dates until they are broken up and begin to form a large clump (For the Cuisine Companion: 5 minutes on S12). Once your dates are broken up, add your aniseed extract and process for 1 minute on the highest speed (S12 on Cuisine Companion) until combined. Roll your licorice into twists or pieces (feel free to make them whatever shape/size you prefer) and place them onto your baking sheet. 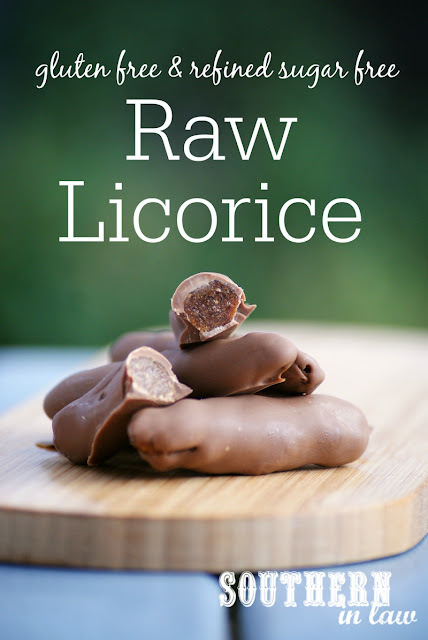 Place your licorice pieces into the freezer to harden (you can skip this step if you don't want to coat them in chocolate and either store them in the fridge for a softer more teeth friendly treat or freeze them for a hard and chewy treat). Make your raw chocolate coating (or melt your favourite chocolate) as per the instructions below. *We have used both dried dates (available in the dried fruit section in a packet) as well as fresh medjool dates and both work fine. Dried dates often work out to be cheaper and they give you a chewier texture, however, both work perfectly! **I use 1 1/2 to 2 tsp aniseed extract to give it a strong licorice flavour, however, adapt the amount to suit your tastes and how strong your extract/essence is. NOTE: if you don't want to make raw chocolate, simply dip your licorice pieces in your favourite melted chocolate or enjoy them as is! Melt your coconut oil with your maple syrup (either in a saucepan or in the microwave) and allow to cool slightly. Mix your coconut oil mixture into your cocoa and salt, stirring to combine. Dip your frozen licorice pieces into the chocolate mixture and place onto a baking sheet lined with baking paper. Your licorice bites will keep for 1-2 weeks in the fridge or months if stored in the freezer. But tell me, what is your all time favourite candy? Licorice is definitely my all time favourite candy! And do you have food allergies/intolerances/special diet needs? What's one food you miss the most? Being coeliac makes me miss real croissants, however, my food intolerances make me long for tomatoes and tropical fruits! Or if you're lucky enough not to have any allergies etc. What's one food you wish was healthier?